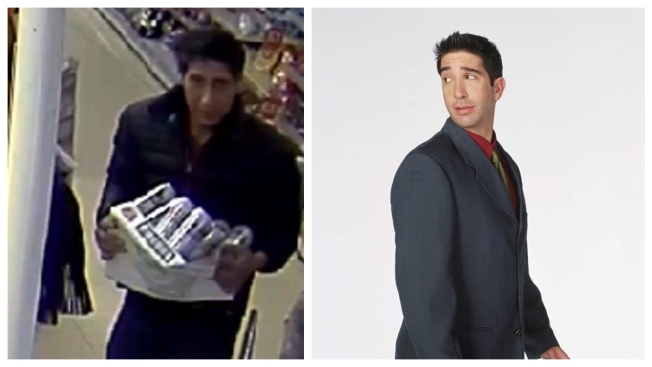 More than a few people thought the British beer bandit looks like television favorite Ross Geller. A British judge has issued an arrest warrant for an alleged shoplifter whose striking resemblance to David Schwimmer made international headlines, after he failed to show up for a court appearance. Abdulah Husseni failed to appear in court in Blackpool, northwest England, on Tuesday to face charges of theft and fraud. Husseni's image became world famous after police published surveillance-camera footage of a man carrying a carton of cans from a restaurant in Blackpool. Social-media users noted a strong similarity to Ross Geller, the character played by Schwimmer on "Friends." The actor responded with a Twitter video that showed him scuttling furtively through a convenience store clutching a carton of beer. Schwimmer wrote: "Officers, I swear it wasn't me. As you can see, I was in New York."